Get Real EN – Deutsche Umwelthilfe e.V. "Get Real: Demand fuel figures you can trust"
How much fuel does your car really consume? Are you familiar with the situation, too? Your car guzzles much more fuel than indicated. Drivers cannot rely on the official fuel consumption data for their vehicle actually reflecting reality. After purchasing a supposedly fuel-saving car, the additional consumption at the petrol pump and demands on one's wallet often become evident. Car manufacturers are obliged to issue honest fuel consumption figures. The corresponding EU regulation 715/2007 stipulates that type-approval CO2 and air pollutant emissions have to be aligned with those emitted on-road throughout the normal life of the vehicle under normal conditions of use. But, in reality, official fuel consumption figures do not match real-world values. And the gap between official and on-road fuel consumption keeps growing consistently for 15 years now: While in 2001 the average deviation from type-approval fuel consumption levels came to 9%, in 2015 it reached an average value of around 42%. During this time, there has been no change in the EU test procedure for measuring CO2 emissions. 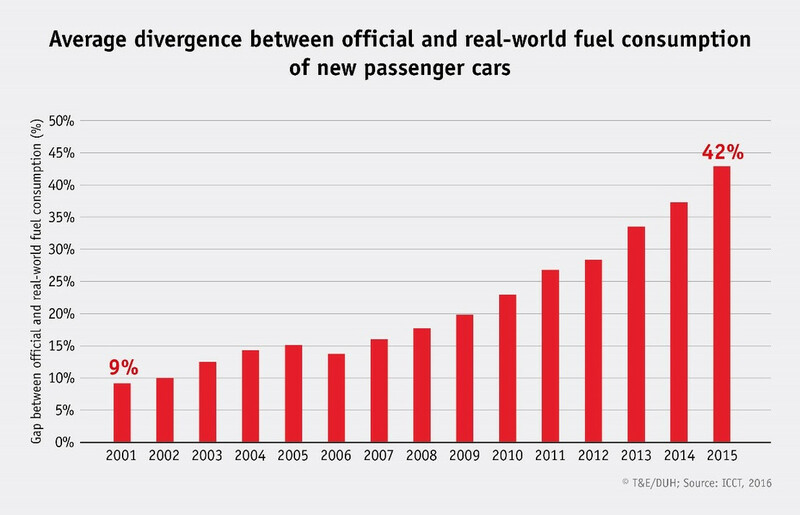 On paper, on the other hand, the CO2 emissions of passenger cars have fallen significantly in recent years. The reason for this is that the car manufacturers design exhaust emission tests required for type approval in such a way that low fuel consumption and correspondingly low CO2 emissions are measured in the laboratory. Due to the fact that no official follow-up of type approval takes place, the automotive industry has been able to expand its manipulations of fuel consumption values unimpeded in recent years. The Environmental Action Germany (DUH) have been pointing out the discrepancy between official and real values for years. The DUH first disclosed this fraud and explained in detail how it came about in 2007. The widening gap between official laboratory figures and actual on-road fuel consumption is one of the biggest environmental challenges facing Europe's transport sector. Without regulatory measures, the gap between fuel consumption figures will be increased further. Drivers will continue to be deceived en masse and the climate will damaged by significantly more CO2 emissions than officially assumed. What are the implications of the gap? The higher fuel consumption of the vehicles means significantly more CO2 emissions are being discharged into the atmosphere than officially assumed. The gap undermines EU climate protection efforts. So far, the EU 2015 target of 130g CO2/km has only been met on paper. Losses in tax revenue: higher CO2 emissions mean higher motor vehicle taxes. Unrealistic figures therefore lead to a significant loss in tax revenue. The estimated motor vehicle tax loss for 2017 accounts to approximately €2.6 billion in Germany. Car owners face unexpected fuel expenses over the useful life of a car of about €7,000, (200,000 km mileage). In Germany and other Member States there is no option to take collective legal action against deceiving fuel consumption figures. Each owner needs to take action based on civil law against the dealer. The landmark decision of the German Federal Supreme Court (BGH, 2007): A deviation of 10% or more is not acceptable and leads to material loss of the car value. Every car owner with a proven increase in fuel consumption of more than 10% can demand that the car is repurchased and compensation paid. German authorities accept the fraud approvingly. They refuse to verify in-use conformity of production vehicles and accept manufacturer’s data without confirmatory testing. The EU regulation 715/2007 foresees penalties in case of noncompliance that are „effective, proportionate and dissuasive“. But there is no consistent monitoring of real-world fuel consumption figures by an independent authority in Germany. The consequence is clear: In recent years, car manufacturers have increasingly manipulated type-approval tests. Manipulations cannot be excluded if manufacturers values are not controlled by an independent body. The Environmental Action Germany (Deutsche Umwelthilfe, DUH) started the campaign “Get Real: Demand fuel figures you can trust”, funded by the European Commission, to address the growing gap between official and real-world CO2 emissions. Together with the Brussels-based organization Transport and Environment (T&E), we want to put an end to this consumer deception. The aim of our project is to improve consumer rights, to advocate against misleading practices in the frame of type approval, and to strengthen market surveillance. As part of the campaign, we want to make public illegal practices such as the detection of test stands or the use of test vehicles that deviate significantly from production ones. At the same time, we want to encourage authorities and policy makers to enforce existing regulations and conduct in-use conformity inspections, to correct misleading type-approval values, and, in the event of fraudulent practices, impose penalties that are "effective, proportionate and dissuasive" (EU Regulation 715/2007). In the future, car buyers must be able to rely on official CO2 emission figures. Establishment of an independent official body for controlling real-world CO2 emissions and fuel consumption figures. Independent inspections of randomly selected production cars. Vehicles should also be tested in case of suspicion of wrongdoing. Correction of official fuel consumption figures if the deviation between type-approval fuel consumption and the ex-post control measurement exceeds 4%. Violations must be published and effective penalties must be imposed. Additional tests on the road under real-world conditions with Portable Emissions Measurement Systems (PEMS) should be implemented. Establishment of an authority responsible for wrong fuel consumption figures, to which car buyers can apply. 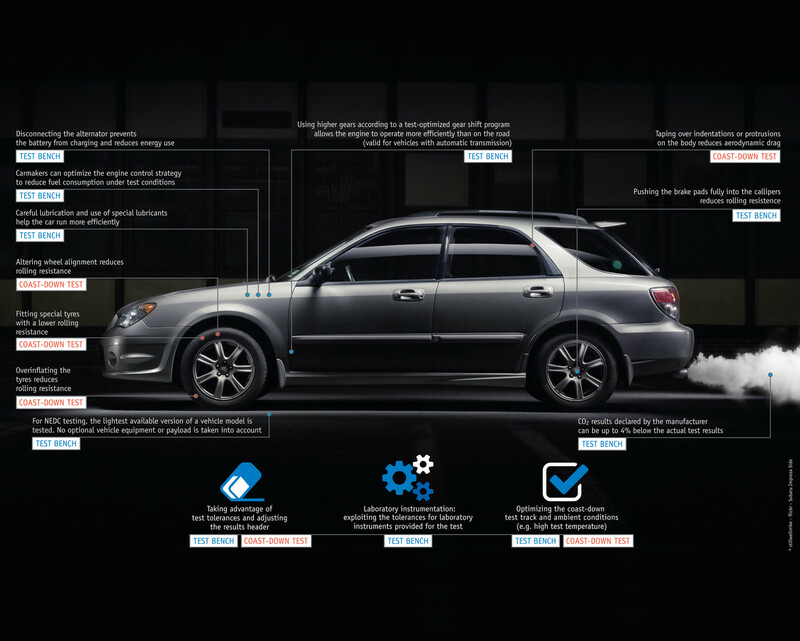 To provide consumers with legal advice to enforce their rights against car manufacturers. A general regulation for damage compensation is necessary. 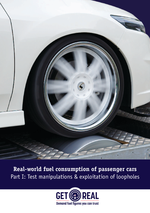 Realistic fuel consumption figures must be available to the public. Type-approval procedure must be complemented with on-road testing for CO2 emissions, similar to the Real-Driving Emissions (RDE) procedure for air pollutants. On-road emissions from passenger cars must be tested with Portable Emission Measurement Systems (PEMS) and test results must be made public. Support us in the battle for honest fuel consumption figures! "Get Real - Demand fuel figures you can trust" is funded under the LIFE program of the EU Commission.